A perfect storm of a story with heart, growth and humor, the little Devon town of Rabbit’s Leap has never met anyone like Mel, and the favored son Tony, is more known for his unwillingness to commit to anyone or anything but his pub, his sister, and his two nephews. Mel, in looking for her next place to be, found Rabbit’s Leap intriguing, far enough from the city to keep her mother’s interest low, with a reasonable space to rent for her café and a small apartment. She’s built her life around thinking what her mother would do, and then taking the opposite approach: tired of being always the 3rd or 4th wheel behind her mother’s desires and romances. A phone call from her mother announcing her impending invasion has Mel at the end of her rope. Hoping to forget her troubles for a moment, she heads to the local pub to drown her sorrows in a glass of wine, when she spots a brand new coffee maker on the bar. Furious that Tony would try to impinge on her business by serving coffee, she does her best to dissuade him. But, Tony bought the machine in a last ditch effort to bring custom to the business. 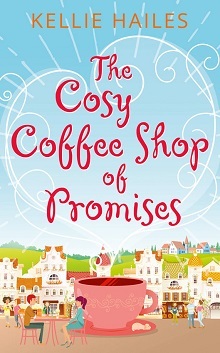 Asking Mel to teach him to cook, updating his menu and giving his pub a chance for increased business, he’s surprised at the response, and agrees to Mel’s conditions: no coffee until the café closes and agreeing to pose as her fiancé for her mother’s visit. Oh this was a fun read: from Tony’s true enjoyment of Mel’s company and heart, to her struggles with the attraction that she feels for him against her own belief that “people leave”, she’s able to see beneath the ‘ladies man’ reputation that Tony has, to the heart of a man, still dealing with grief from the loss of his father, growing up without a mother, and tied to promises made to keep everything the same. When Val (Mel’s mother) arrives in town, his feelings for Mel are more apparent, because his protective nature takes over, as he hadn’t understood why Mel was so closed off, so guarded, and so insecure. Beautifully written, Hailes brings a story that is perfectly balanced with characters that come off the pages, and bring their whole selves forward. Issues that are both easy to understand and empathize with, the strong bonds of friends and family, and some growing up moments for Mel, Tony and Val all contribute to make a quick reading and wholly satisfactory story. A wonderful debut, Hailes is certainly an author to watch on my list. At the age of five Kellie Hailes declared she was going write books when she grew up. It took a while for her to get there, with a career as a radio copywriter, freelance copywriter and web writer filling the dream-hole, until now. Kellie lives on an island-that’s-not-really-an-island in New Zealand with her patient husband, funny little human and neurotic cat. When the characters in her head aren’t dictating their story to her, she can be found taking short walks, eating good cheese and jonesing for her next coffee fix.